This book offers a study of post-9/11 anti-war organizations in the United States and their role in domestic foreign policy debates. The moment of the 9/11 terrorist attacks has been much cited in political and cultural scholarship and much attention has been paid to the promotion of "War on Terror" policies. The social mechanisms behind the circumscription and regulation of national ideals attracted critical analyses from scholars across disciplines; yet the prevalence of scholarly concern with the negative political devices of the Bush Administration at times seemed to risk reproducing the hierarchies of power that underpinned the very issue of concern, and even the War on Terror itself. By contrast, this book celebrates the political acts of individuals committed to changing the dominant politics of the Bush era. 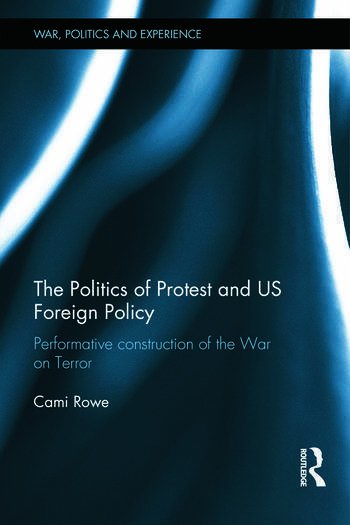 Drawing on participant observation and interviews with the leaders of prominent anti-war organizations including Code Pink and Iraq Veterans Against the War, the book employs Performance Theory to evaluate the capacity of protest to effect lasting social change. In addition to highlighting an often overlooked aspect of foreign policy formation, this volume demonstrates that Performance Studies can be used as innovative approach to Politics and IR. This book will be of much interest to students of US politics and foreign policy, theatre studies, cultural studies, and critical security and international relations. Cami Rowe is Lecturer at Goldsmiths, University of London and has a PhD in International Relations from Lancaster University and an MA in Drama Studies from University College Dublin.